Heat oven to 350°F. In shallow baking pan, toss squash cubes with small amount of oil. Roast about 45 minutes or until tender and slightly caramelized. Meanwhile, in 10-inch skillet, heat small amount of oil over medium heat. Add onion; cook just until caramelized. Set aside. Remove squash from oven; increase oven temperature to temperature called for on pizza crust can. With fork, coarsely mash squash; set aside. On lightly floured pizza stone or cookie sheet, unroll pizza crust; press into 12-inch round. Bake 5 minutes. Meanwhile, core and thinly slice apple; set aside. Top partially baked crust with mashed squash, 3/4 cup of the Cheddar cheese, the apple, onion, gorgonzola cheese and remaining Cheddar cheese. Bake 15 to 20 minutes longer or until crust is golden brown. Cool 10 minutes. 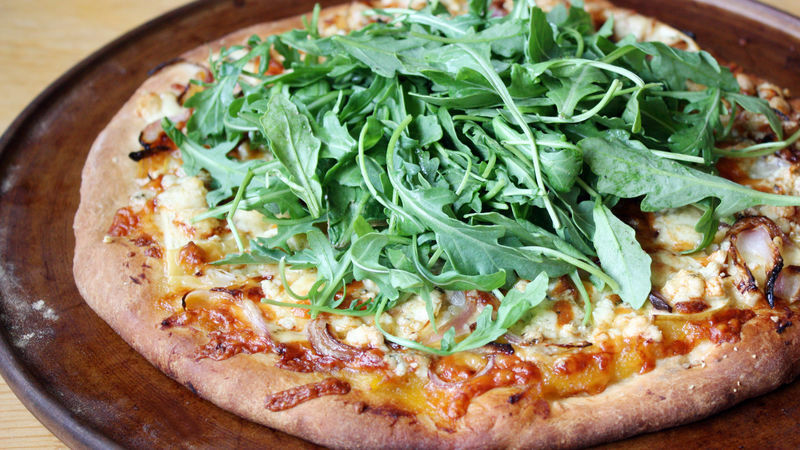 Top pizza with arugula or, if desired, arugula tossed with a splash of lemon juice, salt and pepper to taste. Roasted rutabaga or butternut squash works well in place of the acorn squash, if you can’t find it at your local grocery store. Not a fan of gorgonzola? Swap it out for crumbled blue or feta cheese or shredded mozzarella cheese.